By now, it’s become pretty clear that Amazon Redshift is becoming the preferred data warehouse solution due to a number of factors. 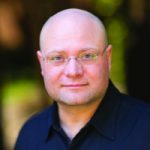 One factor may be its compatibility with Postgresql, enabling talent with existing SQL skill sets to immediately handle and enable access to massive volumes of data; another may be its “cloud-ability”; that is, Redshift’s non-requirement of dedicated software and hardware, as well as extra implementation effort. In any case, one of the challenges of onboarding with Redshift is being able to ingest semi structured data, and at volume, directly to Redshift from a semi-structured or multi-structured data source. Treasure Data is an excellent ingestion point for such data to be routed to other systems, including Redshift. In this post, we’ll walk through an easy, ramp up scenario, using only Visual UI tools that sets up an Amazon Redshift instance and ingests data to this instance via Treasure Data; that is, we’ll use the Treasure Data console to export our query results to Redshift. In future posts, we’ll cover the complete data ingestion pipeline from S3, Postgresql, MySQL (and more) to Redshift. For a quick TLDR, refer to the video. An inbound ingress rule allowing traffic to your cluster. The Amazon Docs should walk you through most of the steps needed here. 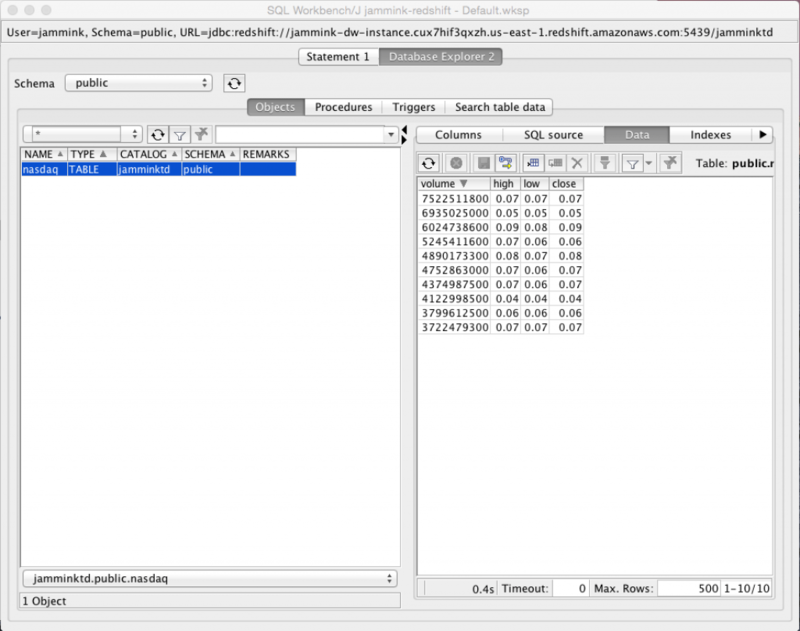 I’m running SQL WorkbenchJ on the Mac with Amazon Redshift (com.amazon.redshift.jdbc41.Driver) installed. 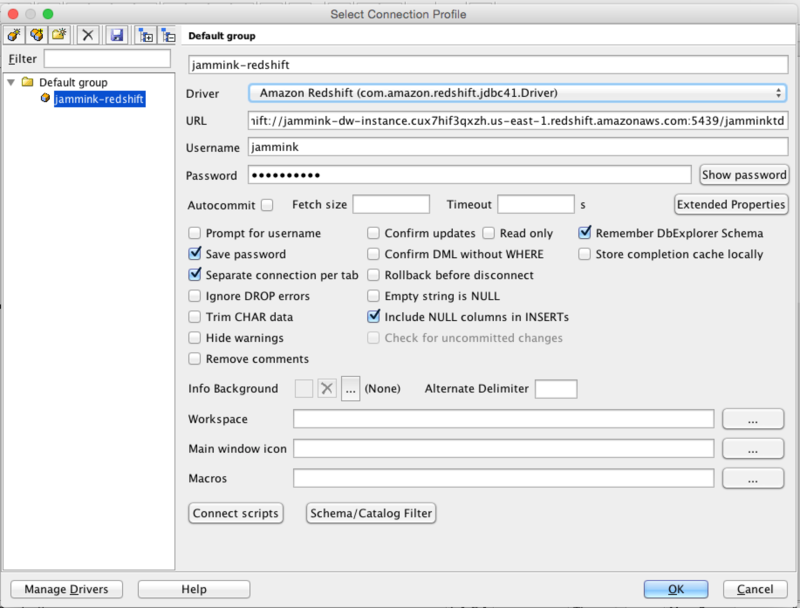 In AWS=>Redshift=>Clusters, click the button to start the process. In the “Node Configuration” screen, Node Type “dc1.large” default is the least expensive Node type. On the “Additional Configuration” screen you can choose whether or not to make your cluster to be accessible from the public internet. Choose “Yes”, and allow Amazon Redshift to provide an EIP for you. Also on the Additional Configuration screen, make sure you have created a VPC security group that allows inbound IP traffic, and associate your cluster with this group. 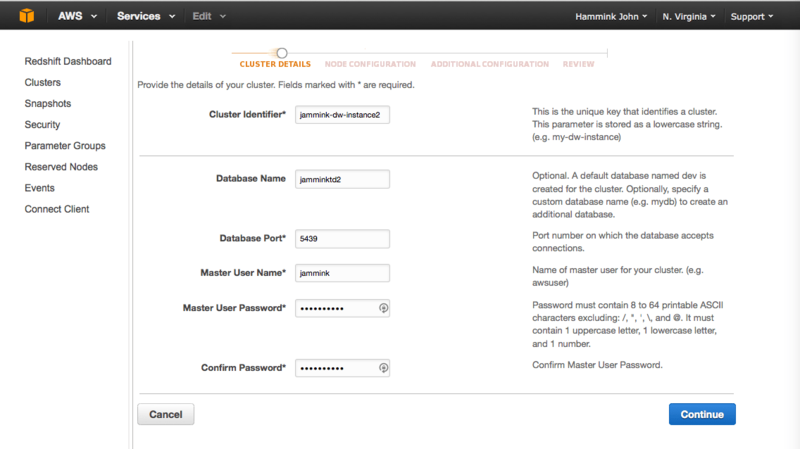 On the Additional Configuration screen, you can choose to encrypt your database. In production, this is recommended, but for the purpose of this demo, I have skipped this step. Finally, review (and save somewhere) your Cluster Properties and Database Configuration before you launch the cluster. This is the key part where we ingest data into Redshift using TD console. For this exercise, we’ll use the sample_datasets that come with Treasure Data console. We’ll use the nasdaq table; we’re interested in the top 10 trades (high, low and close) by volume. In the “Database: ” dropdown, select “Sample Datasets”. In the “Type: “ selector, select “Presto”. 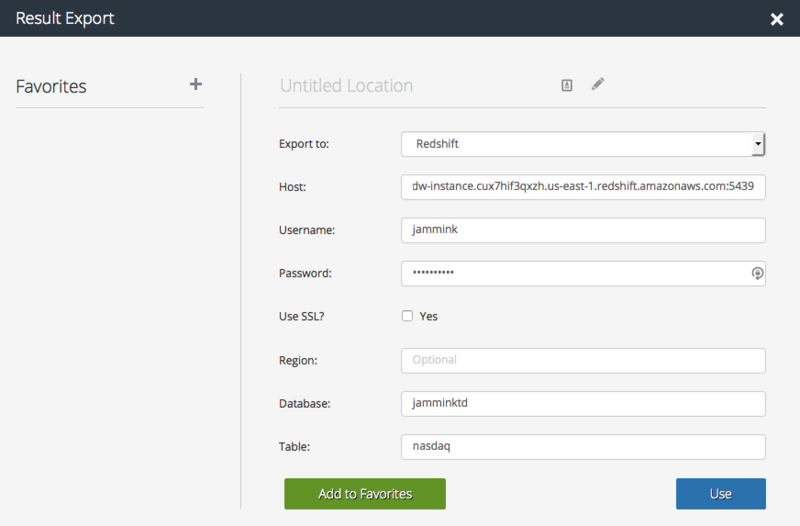 Enter your Username, Password, Database and Table names as you have configured them on your Redshift instance. Use “replace” mode if you want to overwrite the data (Note: a good way to “clean” your Redshift database is to run the query above, instead setting “LIMIT 0”. Otherwise, use “Append”. Finally, click “Use”. Then run the query. Once you’ve configured that, plus your usename and password, click “OK”. You can view the data you’ve imported to Redshift by clicking your table row in the left pane, and the “Data” button above the right pane. Voila! The top 10 trades by volume. Any queries you run additionally from your SQLWorkbenchJ can also be seen in query view on your AWS instance. To view them, click your cluster name under Redshift Dashboard => Clusters, and select the “Queries” tab. As you can see it’s relatively easy to set up Treasure Data to funnel data into a Redshift instance. The trick is remembering all of the parameters you need to set when making the connection, but there actually aren’t that many. 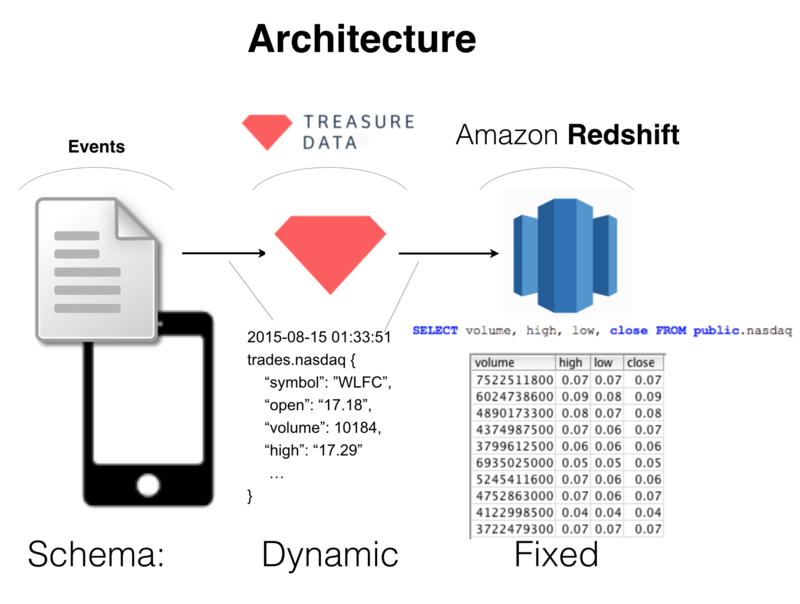 Treasure Data’s strength is dealing with semistructured data coming from many sources; with Amazon Redshift as your data warehouse on the backend, you can truly leverage the best of both.